The Secret Sun: Shekinah Rising: The Missile Defense Logo "Controversy"
Shekinah Rising: The Missile Defense Logo "Controversy"
"Team Obama’s anti-anti-missile initiatives are not simply acts of unilateral disarmament of the sort to be expected from an Alinsky acolyte. They seem to fit an increasingly obvious and worrying pattern of official U.S. submission to Islam and the theo-political-legal program the latter’s authorities call Shariah." "I'm having trouble seeing past the crescent and star in the new logo," one critic posted on WashingtonTimes.com. "Is this our signal to the muslim world that we're not going to shoot down their missiles?" It's funny, these are the people last week who were complaining Obama was killing too many terrorists (to call American politics a clownshow is to insult honest, hardworking circus performers). I would think Muslims might see a US defense project incorporating the (inverted) crescent and star as a profanation and an implied threat. Is that why this ridiculous controversy was manufactured, to preempt more legitimate concerns? I've said it before, I'll say it again: Whenever a controversy erupts in the media over symbols, it's always an intentional diversion disguising a deeper meaning. None of the media shills pointed out that the "star" is actually two crosses superimposed upon each other. Note those elongated bottom rays. Coincidence? Maybe, but maybe the whole thing is all a coincidence, then. The effect resembles an X (or a Chi, if you prefer) laid over it, just as the Church of Scientology cross does. Why they use that symbol is another issue altogether. Some have speculated that Hubbard borrowed the logo from Crowley, who decorated the reverse of his Book of Thoth Tarot deck with the cross, which is derived from Constantine's chi-rho cross (why it is is another issue altogether). Sound familiar? Not a few researchers noticed that Shock and Awe- the big buzzword used during the early days of the Iraq invasion- sounds not a little bit like "Shekinah." Waite also writes that "according to Kabalism (sic), there is a Shekinah both above and below." "Above and below." You mean like in the desert and the sky? Some occultists and students of the Tarot interpret the High Priestess as an incarnation of Hathor as well. Hathor was associated with the sphere, the crescent (which corresponded with her horns) and was known as the "Lady of the Stars." (Hathor) was also a goddess of destruction in her role as the Eye of Ra - defender of the sun god. According to legend, people started to criticise Ra when he ruled as Pharaoh. Ra decided to send his "eye" against them (in the form of Sekhmet). She began to slaughter people by the hundred. When Ra relented and asked her to stop she refused as she was in a blood lust. So, an entirely different picture is starting to emerge from these symbols than the one the medias- both the mainstream and the so-called "alternative"- would want to make you believe. Think about it- which crescent and star do you think elements in the military would want to identify with- that of Islam or Sekhmet/Shekinah? ...then look again at Hathor's headdress. How about that, eh? 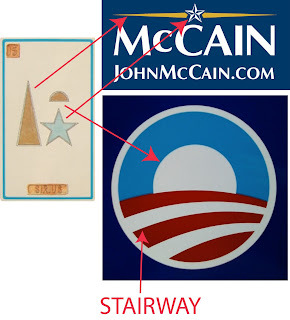 Between the MDA logo and the Stairway to Sirius. Note that the "earth" is a pure blue globe. Kind of like a water planet, no? Coincidence? Maybe. The world's full of coincidences these days, isn't it?